I was in need of some cards to mail out last week to some new grandparents. The beautiful, even layers were created with my Perfect Papercrafting Tools! See my sidebar for details on how to save money when ordering! Pinch me, I think I'm dreaming! 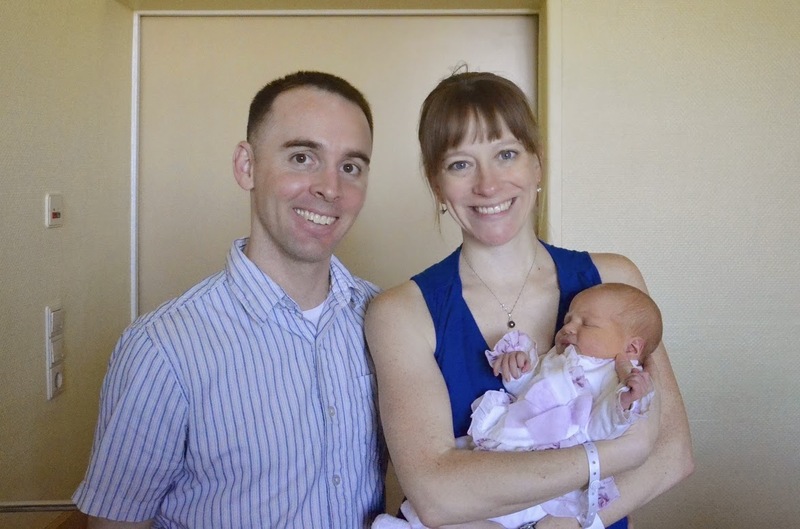 Many of you have been sending emails, inquiring about our daughter and son-in-law, wondering if they'd had their baby. I thought that I'd update you all. 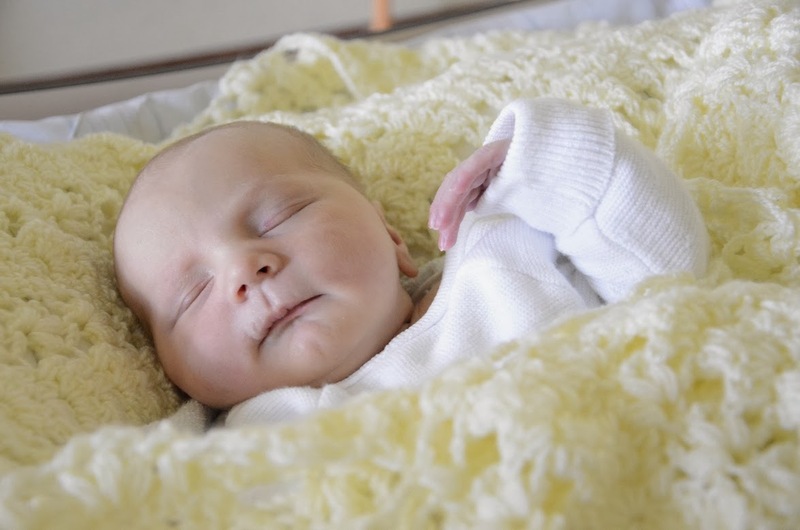 Sweet little Lorelei was born last weekend, and of course, she is the prettiest grandbaby ever! The first two photos were taken as they were leaving the hospital. 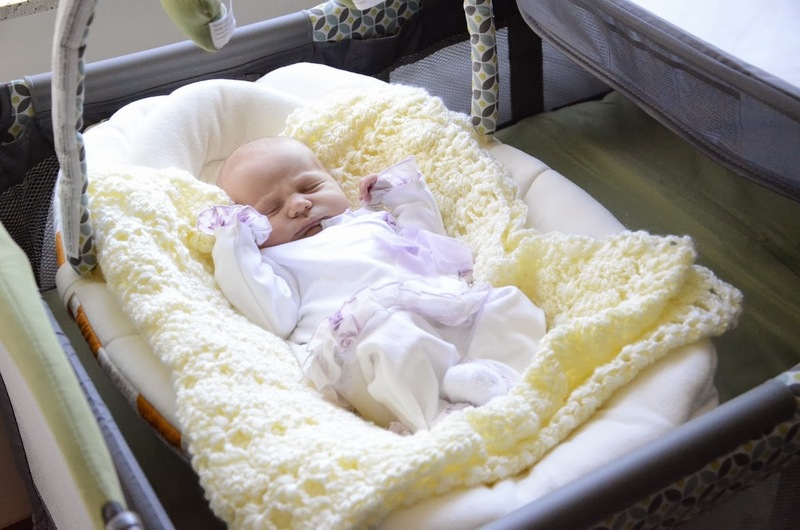 This one is Lorelei, home for the very first time. Thank you so much, to all of you who have asked about them over the last several months. It's my day to post on the Die-Versions blog, and I've chosen to spotlight one of the Sweet Spot dies from the newest release. 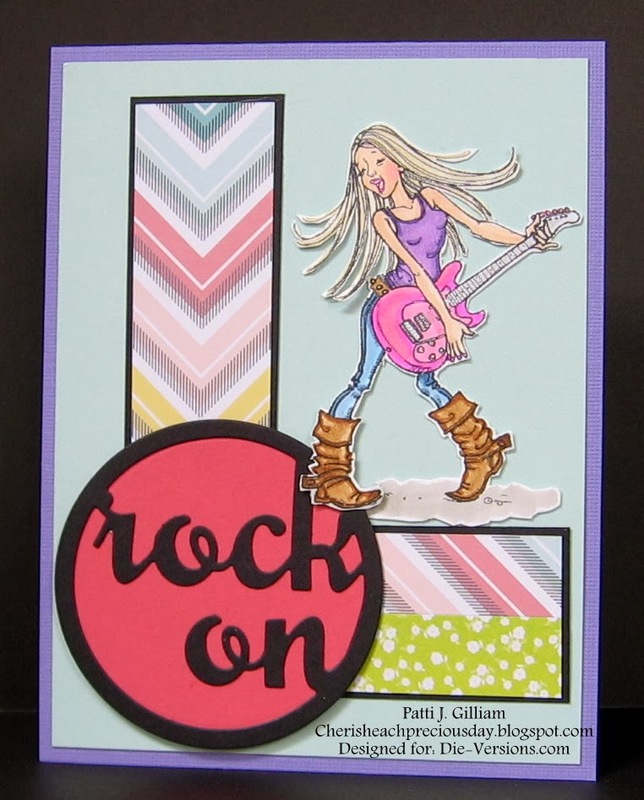 "Rock On" is the die that I've used, and it was fun to work with! Cuts like butter, and you can easily just use the words without the circle if you prefer. Supplies Used: Die-Versions "Rock On" Sweet Spots DVSS-066, Mo Manning Digital Image, Copic Markers, Cardstock from my stash, and American Crafts Dear Lizzy 5th & Frolic Patterned Papers (a gift from my friend Marian!). And I always use my Perfect Papercrafting Tools to achieve the beautiful, even matting! See my sidebar for details on saving money - you all need your own sets!!! Seriously! I rarely craft without them! This die needed the perfect image, and when I saw this one at Mo Manning's digi site, I knew it would showcase the wonderful die perfectly! It was a special 'Girl's Day In' - Look what we made! I was one of five ladies invited to our friend, Shirley's home, for a crafting marathon that began on Friday morning EARLY, and ended Friday night LATE. It then resumed on Saturday morning EARLY and went into the early afternoon. Three of the ladies had traveled 1.5 hours, so they brought jammies and stayed all night. 2 of us live very close, so we came home, to return the next morning. Thanks to Shirley for hosting, and for all of the ladies for the FUN weekend! Warning: This post is photo heavy - wink, wink! This was a project of mine. 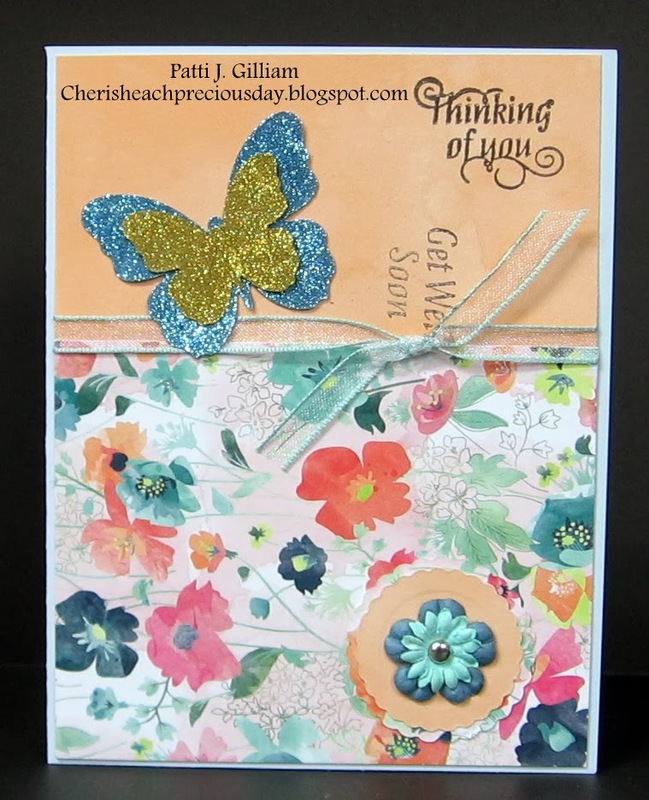 We used a Sweet 'n Sassy Background stamp, and an Amuse Studio sentiment. Heat embossed with white powder, then sponged on distress inks. Fast and fun! This was another of my projects. Supplies used: Die-Versions Crochet Lace Border Die, Hero Arts Stamp/Die set for butterfly, Close To My Heart Sentiment, Amuse Studio inks, Copics, and cardstock. Another fast and pretty! This was a project of Shirley's. Oh, so pretty - love the pastels! I was chatting and not paying attention. The two small flowers were to have been blue. OOPS! Beautiful card! This was another of Shirley's projects. LOVE this! It's a new stamp set from Stampin'Up! called Grunge, or something like that. We had seen a similar card online (so sorry - can't remember whose it was), and just HAD to give it a try! 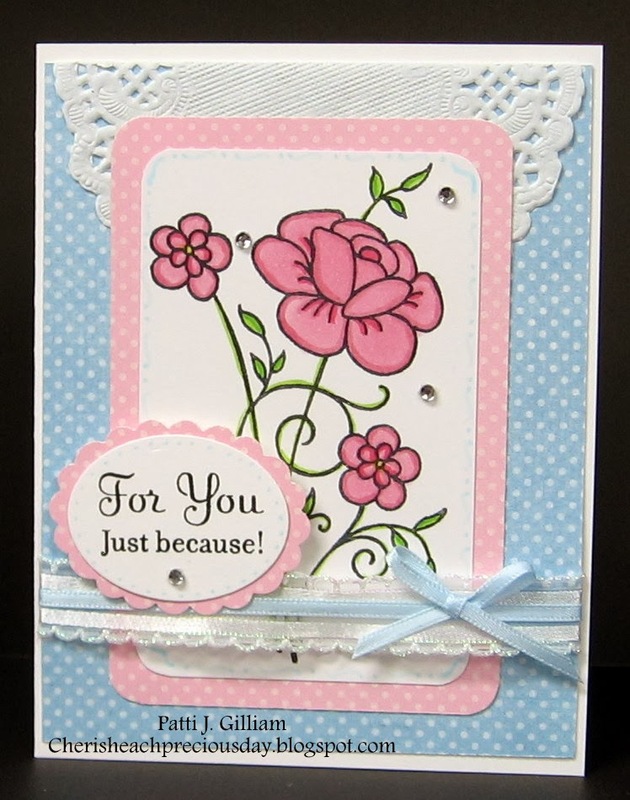 This beautiful card was one of Diane's projects. OMG, it was SO much fun making those satin butterflies! We used Elizabeth Craft Silk Microfine Glitter and double sided sticky paper for the butterflies. Note the OOPS (can't miss it - it's a BIG one!) on this one? I wanted a different sentiment than the Get Well that everyone else used. I thought I'd stuck it on the back side of the acrylic block, but guess not~so this one's in my 'fix' pile! Marian, who is Donna's mom, brought this beautiful project. The technique is called Northern Lights. OMG, what a gorgeous card this makes!!! Marian doesn't have a blog, but creates such pretty things!!! This was a project that Cheryl brought. 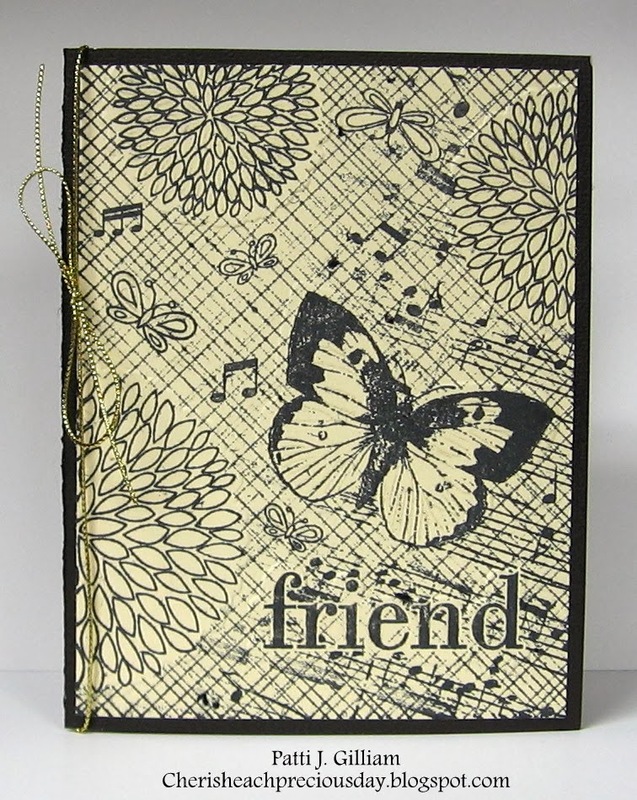 This was a stamp set and matching embossing folder. We stamped the image, which was beautiful alone! Then, we lined up the image in the embossing folder and ran it through the Cuttlebug. Talk about quick and elegant - OMG!!! Cheryl has no blog - but she will retire in 2 years, and we'll be sure she gets one then! This was another CAS of mine. This is a Bugaboo digi image. So it was print, color, and add a few sparkly dots with a Sakura pen. Glossy Accents on the bubbles was the perfect finishing touch. 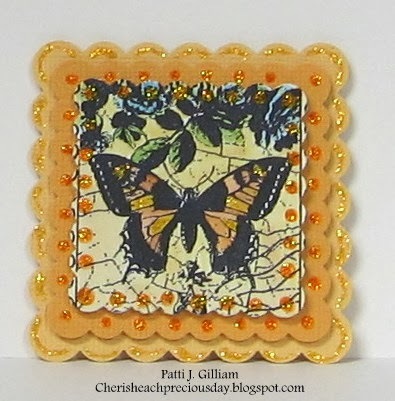 The borders on the card base were made with a new set from Close to My Heart, which I love! 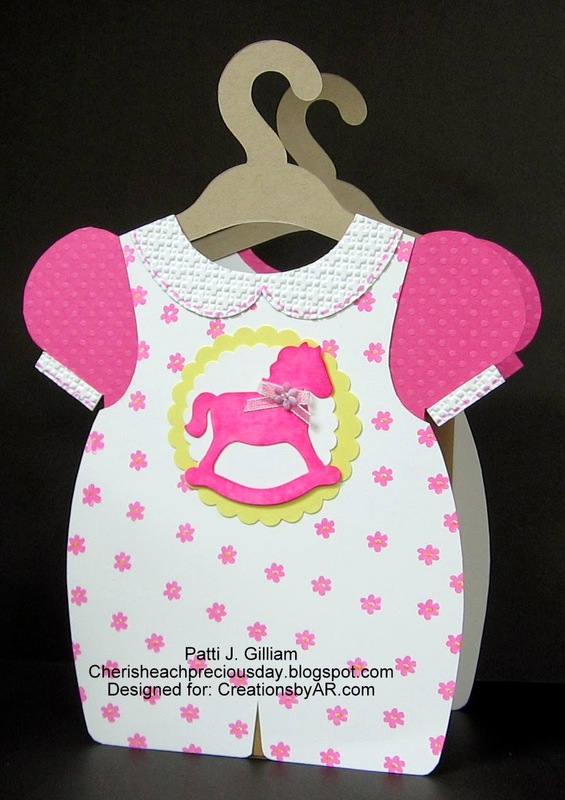 This fun card was another of Cheryl's creations! What a fun card - I think it's going to go to my Senior Angel that I am a buddy to. I'll include some Microwave popcorn, and it will be a fun package. 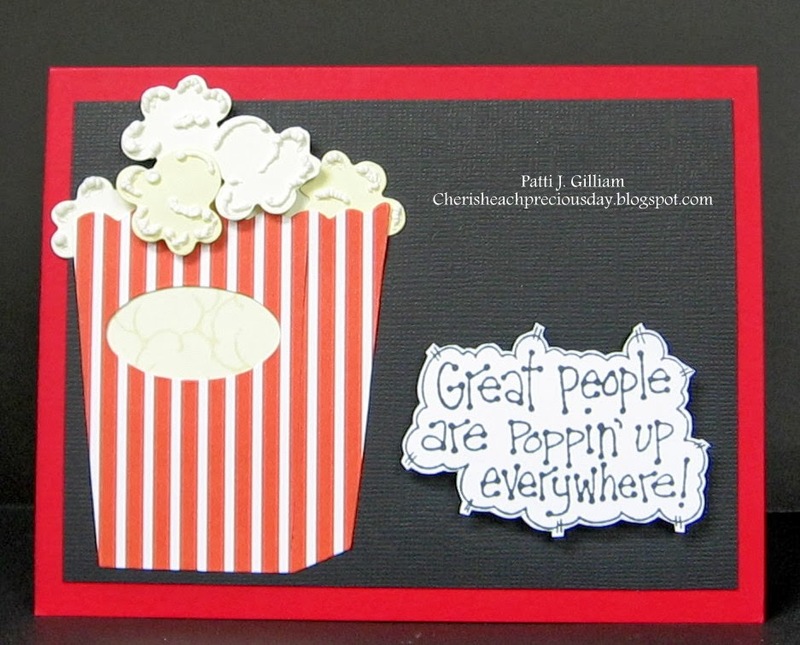 We used some Liquid Applique on the popcorn for some extra dimension. Donna brought this lovely creation. She showed us how to make a 'finger bow' that we had seen on a Stamp TV video. This card is fun, as it uses the negative pieces left over after dies were used. And, we have the die cuts for another card later! Another of Donna's projects! I am totally smitten with that red and white ribbon! The stamps on both of these are from Amuse Studios, as are the inks. Here is another gorgeous creation that Shirley contributed. 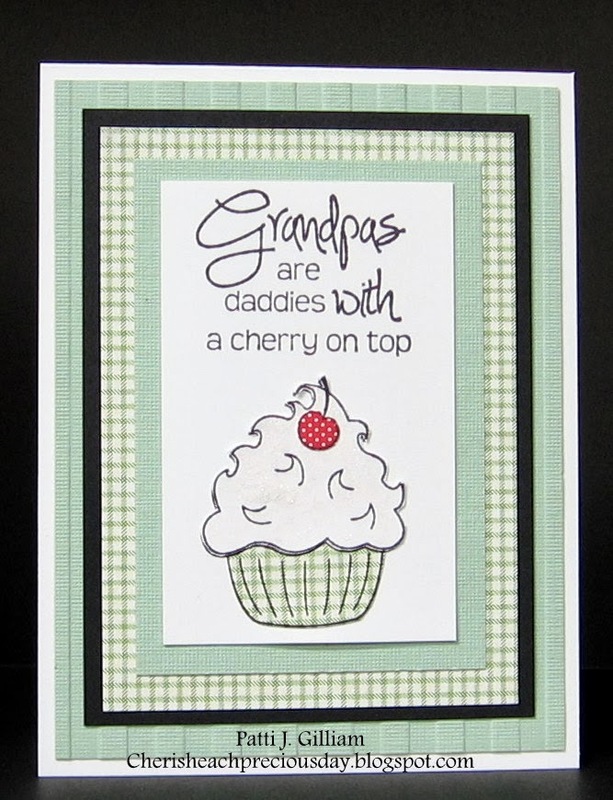 The image and sentiment are heat embossed on watercolor cardstock. Then, we used distress markers and scribbled different colors. Used a water brush to blend each color to the edges. Isn't this just too pretty??? Donna brought this beautiful card, too. It's pretty self-explanatory! Can't wait to mail it to someone special! This is a magnet. I've really zoomed in, so you can see the details, but it only measures about 2.25" square. Pretty, pretty, pretty! Shirley dreamed up this one! Our friend Diane, brought another wonderful project with a great, fun fold, but I had to leave Friday night before we got to it. I have the kit here, and as soon as I create it, I'll post it for all to see. The only other thing I can remember us making is an A2 card box, using our Envelope Punch Boards. It was so quick and easy! However, my boxes were empty, and got squashed, so I have no photo to show. That will be a project for another day! So....if you have hung in there with me through ALL of these photos, you deserve a high five! Be watching for some special blog candy! Before February is over, I will reach 1,000 blog posts, and I also missed my 5th Blogaversary! I'm thinking maybe the latter part of March..... working on something special for my faithful followers! Thanks for stopping by, and taking a photo tour of craft marathon! Hello! No baby news yet - will post as soon as we have something to report! So, I'm pretty sure we woke up this morning in southern Florida, or Hawaii, instead of Missouri. We are quickly approaching 40 degrees, the birds are chirping, AND the sun peeked it's head out for a few minutes. Loving it! 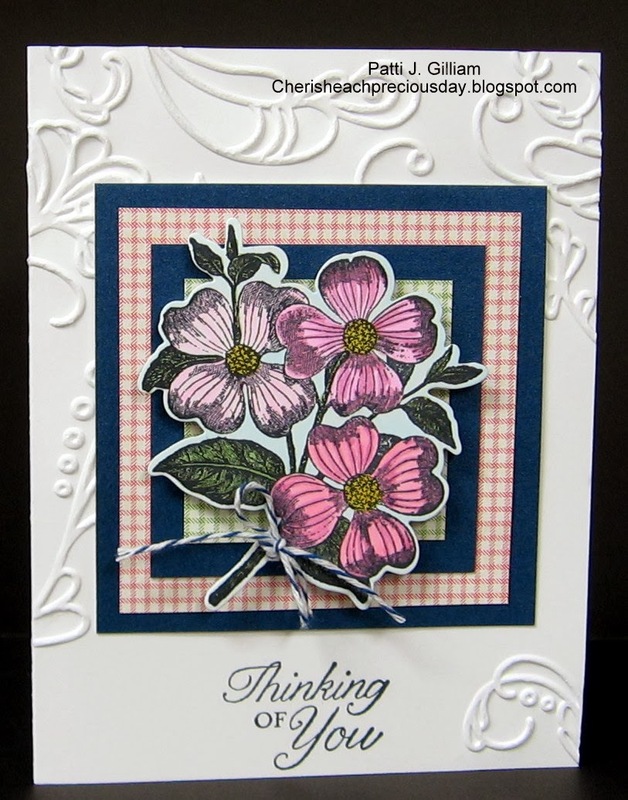 This card was made using a Hero Arts Flower stamp. Again, this was created for a special order. 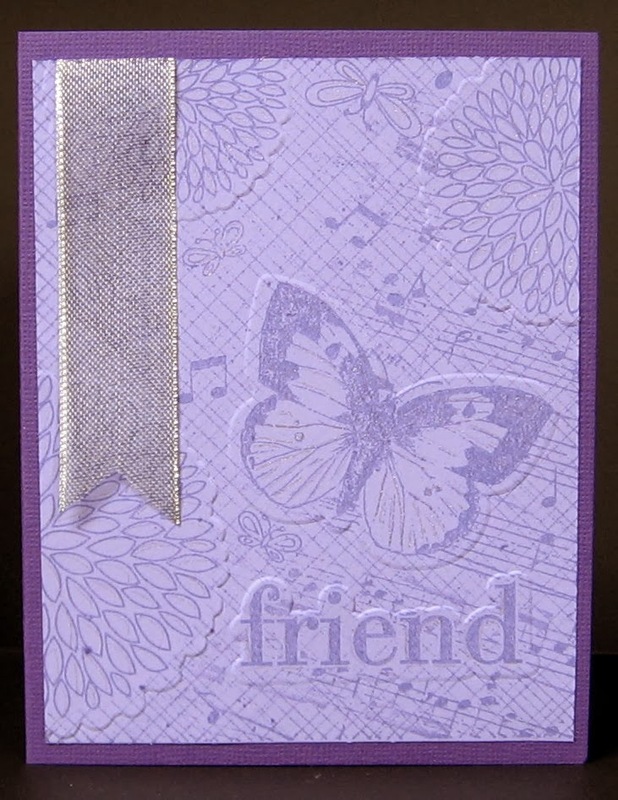 The embossing folder is a Stampin' Up! folder, the papers are Little Yellow Bicycle, and the coloring is Copics. Sentiment is Amuse Studios, and the twine is from my stash. 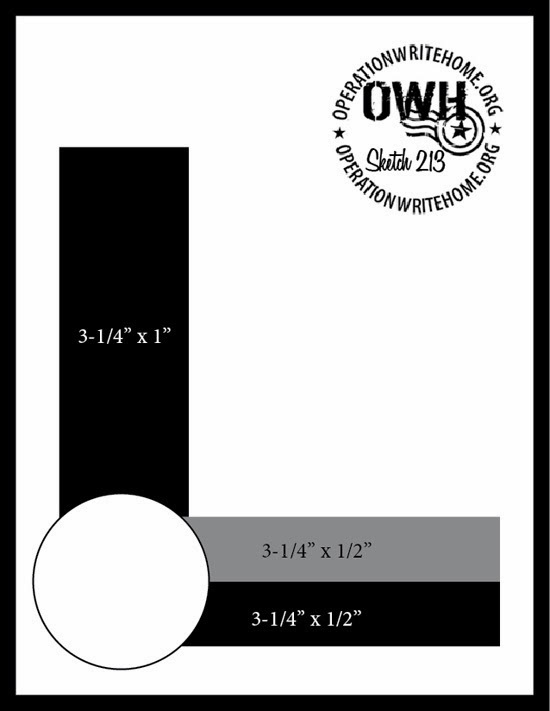 Of course, my mats were created with my Perfect Papercrafting Tools! Check out my sidebar to see how you can get 5% off any order, and see videos showing how the tools work. Hope you are all enjoying a day that is equally as pleasant as ours is today! I'm off to do a bit of shopping, and then some walking. Have a great Tuesday, and thanks for stopping by! Thought I'd say good morning to all, and post a card I made last week for a special order. Hero Arts Stamps, Amuse Studio Pigment Inks - Finger Dauber. Ink was sponged onto the stamp with the finger dauber, then stamped to card. 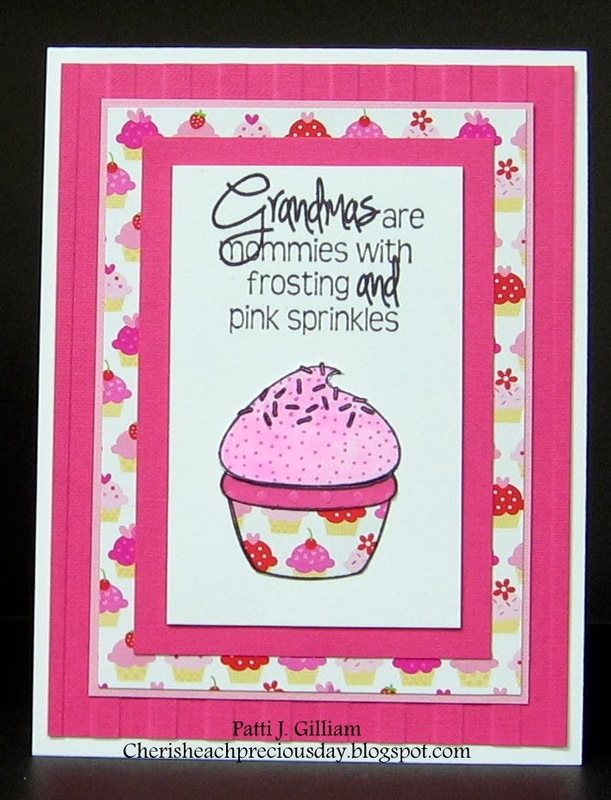 Sentiment was double stamped with two shades of pink. 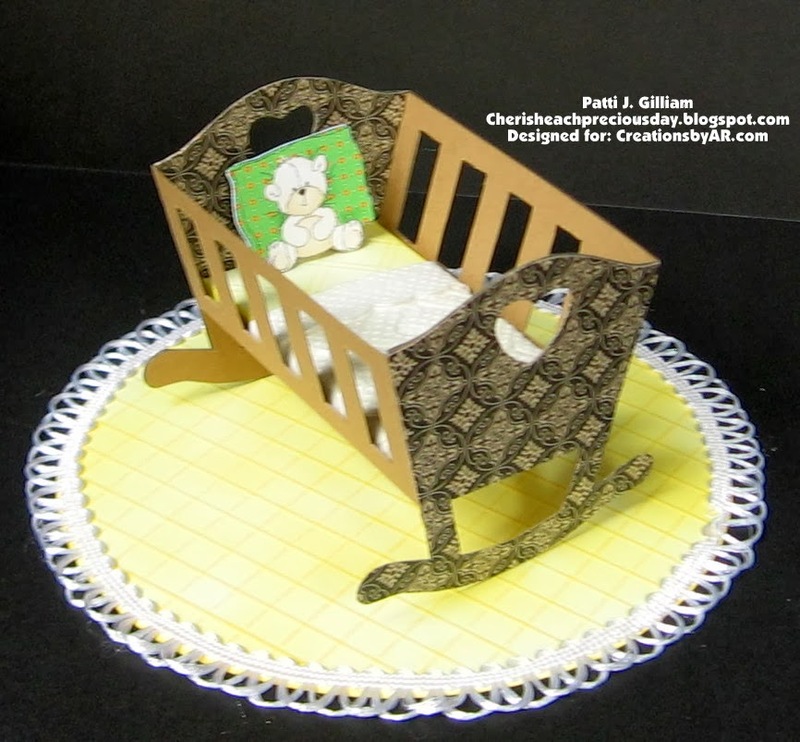 A scrap of ribbon onto a Kraft base, and VOILA! 10 minute card! Hope your weekend is good - Brrrr.......and that you are staying in and staying warm! My dear hubby is a keeper! 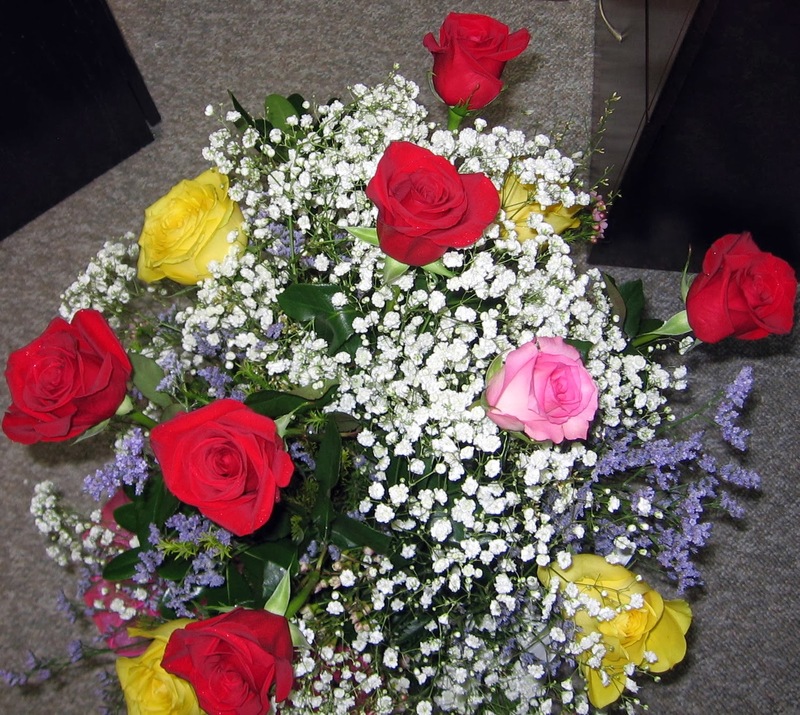 He ran to town this morning to get the mail, and came back with these beautiful flowers, AND a box of Russell Stover chocolates (which we will feed our Sunday School group Sunday morning!). 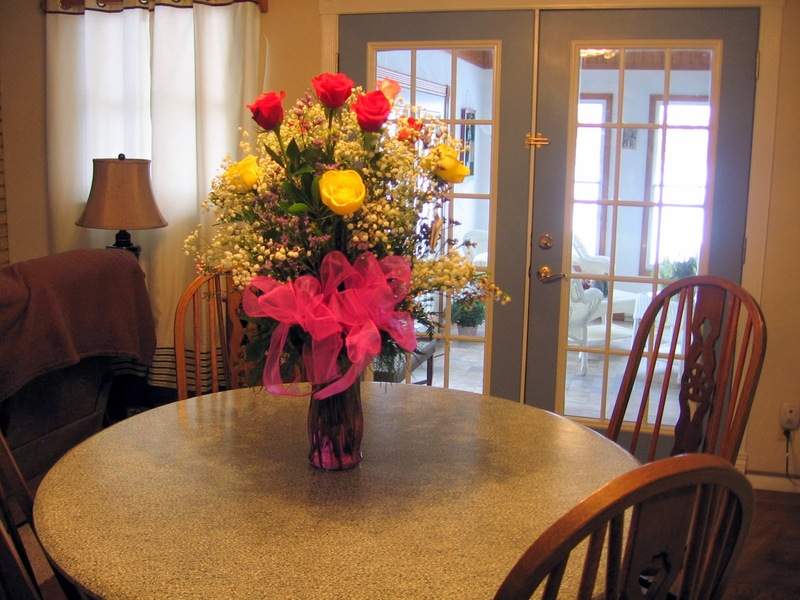 The bouquet is huge, so I took a photo looking down on them, and then on the kitchen table (which is 48" across) to give an idea of the size. BUT....what makes it special is what he ordered! 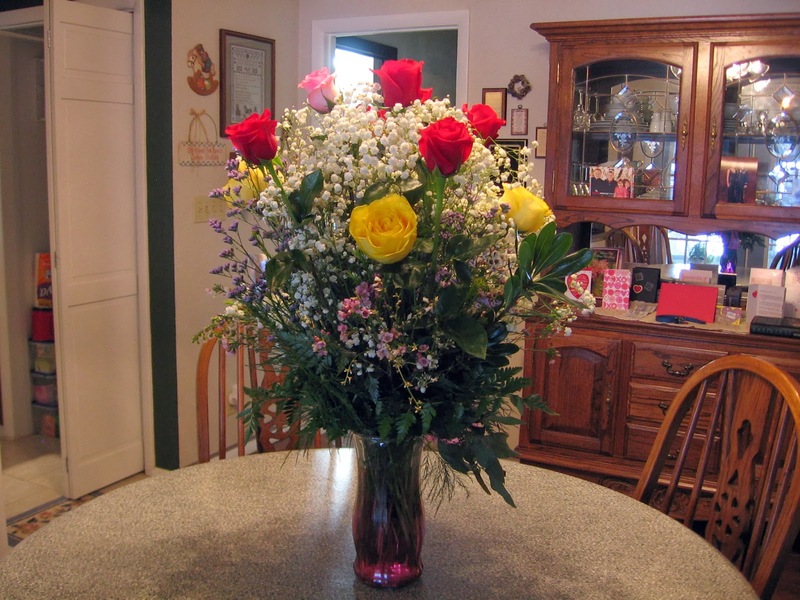 Looking at arrangement from front. It's for our sweet granddaughter who may arrive this weekend! DD and DSIL are both ready to meet her! Now, you must admit - that's pretty special!!! Looking at arrangement from back. Straight ahead, through the doorway is our CRoffice. After almost 41 years, he is the love of my life, my soulmate, my best friend (sorry ladies! ), and I am definitely keeping him! 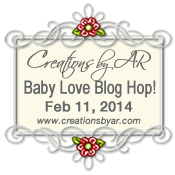 The February Release for Creations by AR is here, and the theme is Baby Love! here is what I created with the new releases! 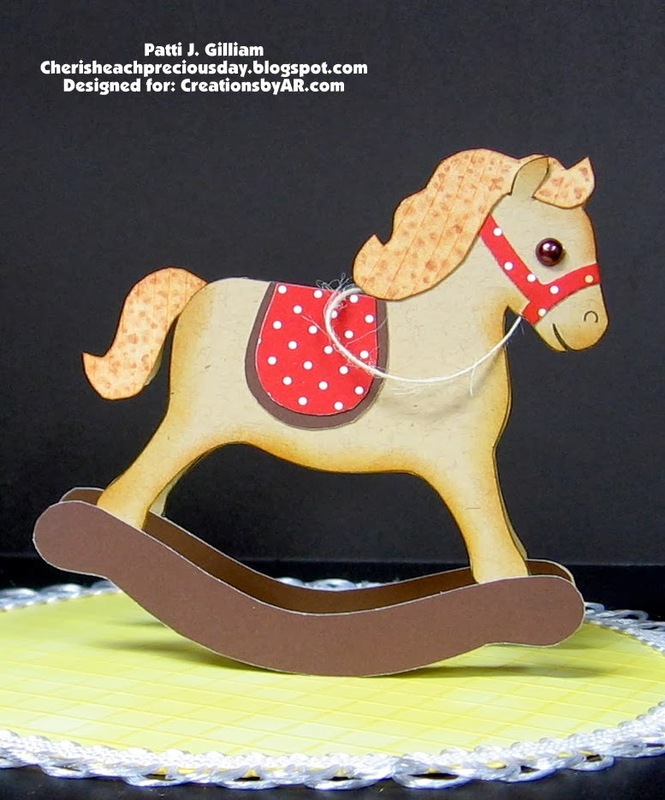 First up is this precious little Rockin' Horse Card. Isn't this just the sweetest thing? Overall measurements are about 4" by 4". Next, is the Rockin' Cradle. OMG, what a fun little creation this is! It measures 3.25" wide, 3.25" tall, and 3.75" long. The 'blanket' is a piece of paper towel, and the 'mattress' is something I created from a scrap of cardstock and a scoring board. Had to make a matching rug, of course! And the little pillow & bear is a digital image from Doodle Pantry. Isn't it just a perfect finishing touch? Now, you just have to see these darling Dress Up Baby Bag. These worked up so quickly! I didn't have any wonderful pink cardstock, so I just took a small stamp, and some pink ink, and dabbed flowers all over the white piece. The centers are colored yellow, but don't show up very well in the photo. Measures 6.8" W x 9.5" H x 2.75"
Last, but not least, I used the Baby Love cut outs (included in the Dress Up Bag Templates), and created a couple of super quick cards. Creations by AR templates come in SVG or PDF files. As I don't (yet) own a cutting machine, I cut all of mine by hand. This month, my teamie Sue, sent me the two Baby Loves, the tiny horse on the pink bag, and a few other teensy little items! Thank you so much, Sue! You rock! This month, you can purchase templates individually, OR you can purchase the bundle, and get all three new templates for $12 - what a bargain (a savings of $3)! Hope you've enjoyed these wonderful templates! How can you win your choice of the three new templates? Comments will be accepted until Friday, February 14th, at 12:00 noon EST. One random winner will be announced on Friday, February 15th, on the Creations by AR Website and Facebook Page. Time to hop! Have fun!!! This card uses the Die-Versions Whispers "Rosy Music" #DVW-327. I had seen 'piano' cards in the past, and thought it would be a great way to showcase this beautiful die. 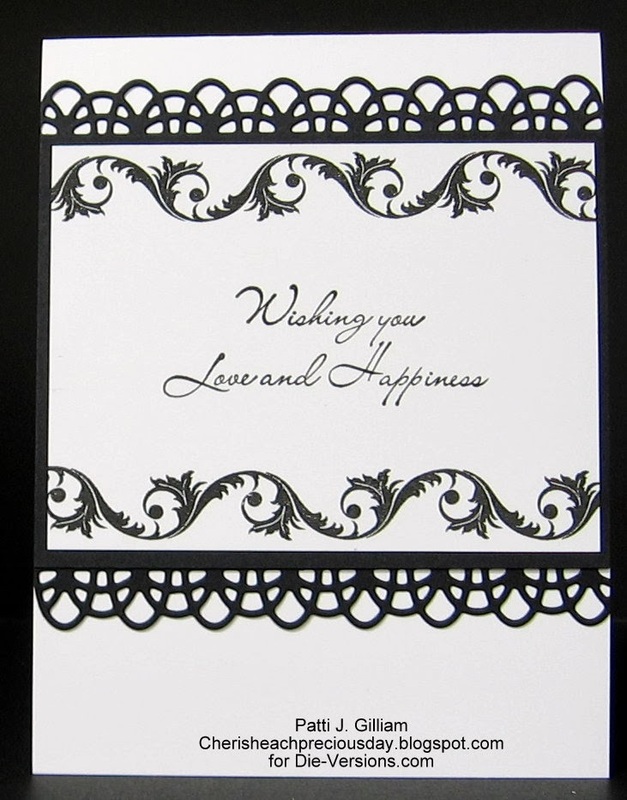 To make this card, I just cut strips of white and black cardstock. I outlined the white strips with a gray Copic marker to give them some depth (too much, actually! ), and just adhered them to my card base. Added the black strips and a ribbon (left over from our daughter and son-in-laws reception last year) and voila! What fun. Since I'm a Chemo Angel/Senior Angel, I use a LOT of Thinking of You cards, so the sentiment was not difficult to decide on. This next card was fun, too! So often, we get these border dies, and use them only at the very top of a page. 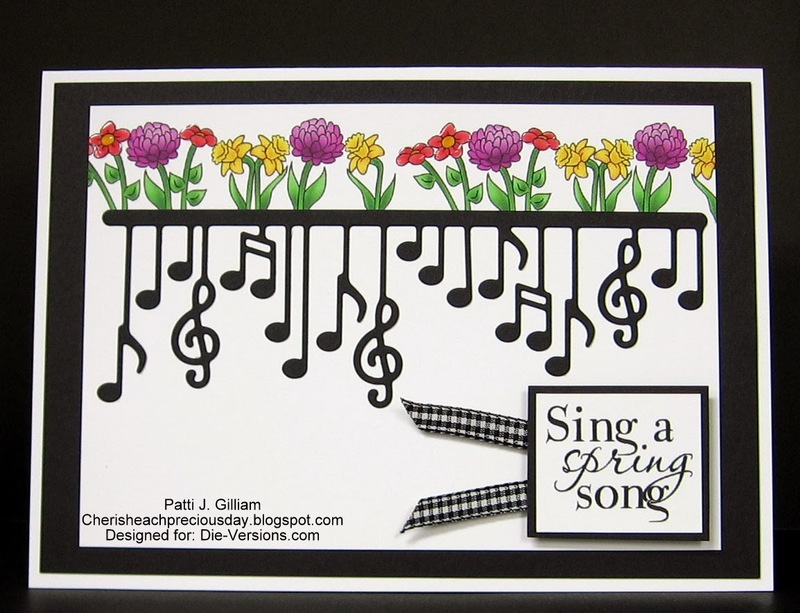 I recalled this fun row of spring flowers and sentiment from DoodlePantry.com, and thought that this die (Die-Versions DVW-335 "Music Waterfall")would be a perfect division between the image and the sentiment. The flowers are pre-colored - the only addition is a touch of glossy accents on the orange flowers. I think you can see the shine if you enlarge the photo. Of course, I used my Perfect Papercrafting Tools for the great mat! Notice that I used two sizes!!! 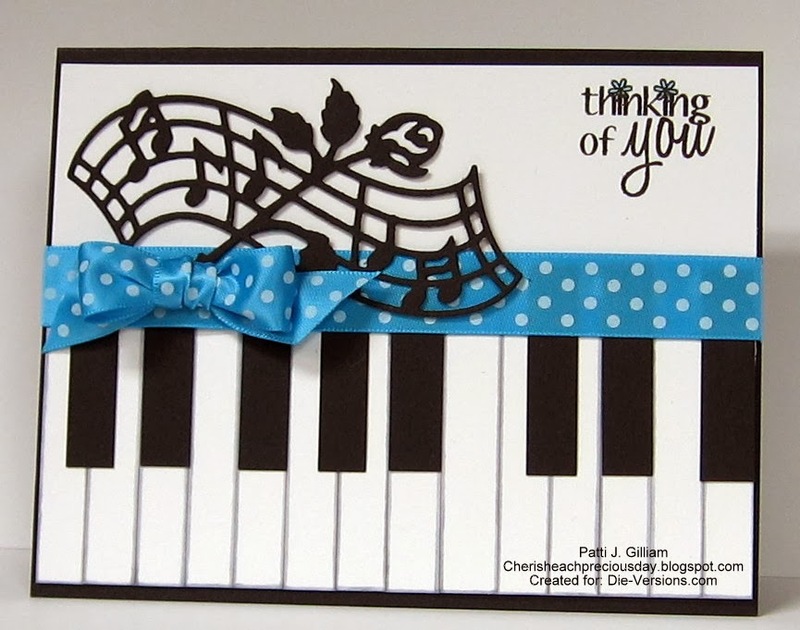 I think this card will certainly brighten someones day, and I'm sure we are all ready to sing those songs of spring! 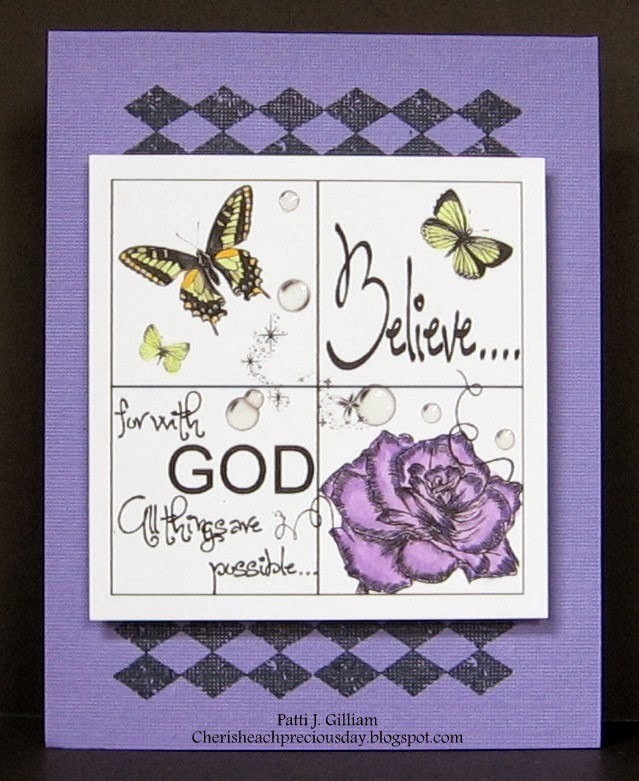 I hope you'll check out the Die-Versions blog for more beautiful samples using the February release dies! We'd also love it if you would 'like' us on Facebook! You can also watch videos of our dies on You-Tube! And here's our Pinterest Page! DIE-VERSIONS' February release "THE MUSICAL" is here!!! 20 new dies are ready to be shipped, available today in the DIE-VERSIONS' online store! 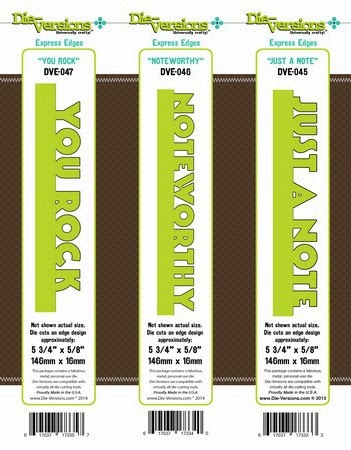 These exciting new designs are perfect for so many different uses. Just look at these gorgeous silhouette dies! Don't you just love these kids? AND.....there are 10 new WHISPERS dies! These are very intricate, but cut beautifully. We also have new Fonts, and new Wee Petites Dies! 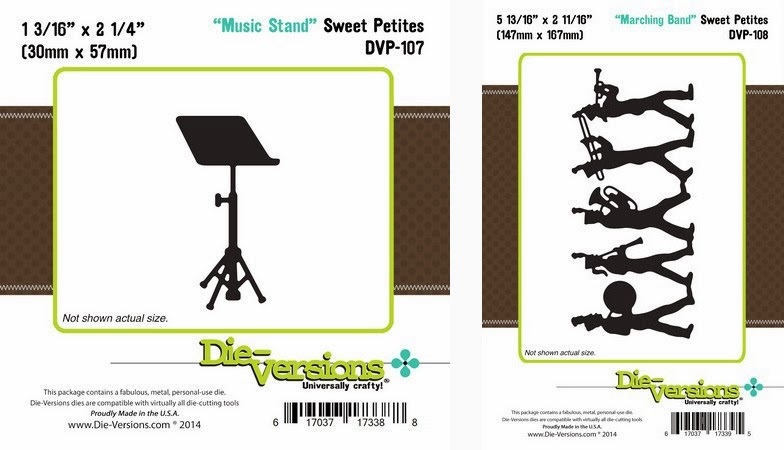 Be sure to visit the DIE-VERSIONS' blog today for a chance to WIN a die from the new release! Today, I'm happy to be posting my creations on the Die-Versions blog! that they cut like butter? Wow - such a joy to cut with! 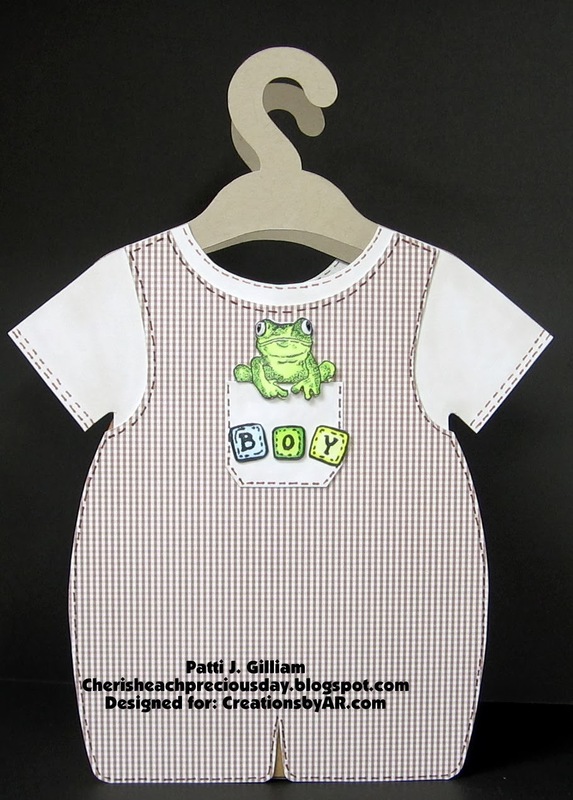 The card above was made using the Die-Versions DVW-322 "Crochet Lace" Die. It was cut twice, and adhered on top and bottom of a black panel. 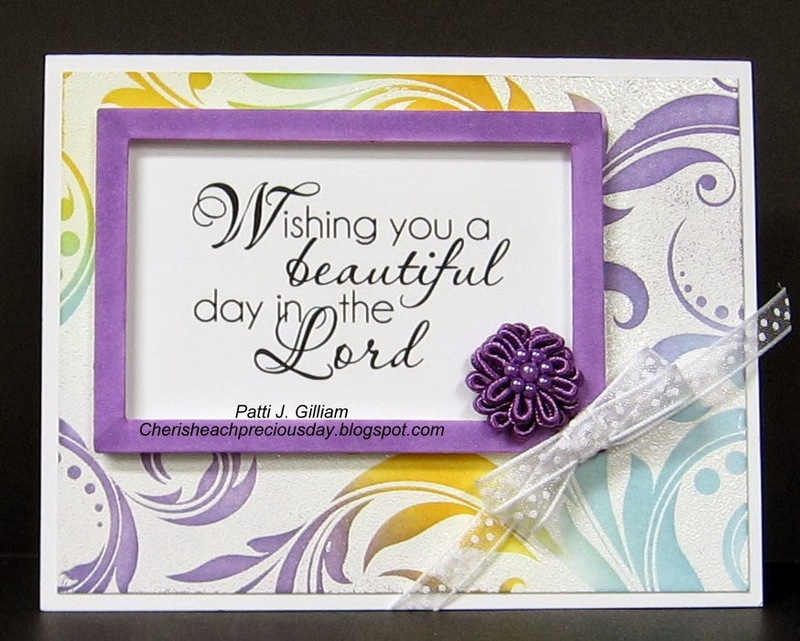 A flourish border stamp was added to the top and bottom, and a sentiment to the center of the panel. The panel was then attached to a solid white card base. Black and white is a favorite color combo of mine - always looks elegant! 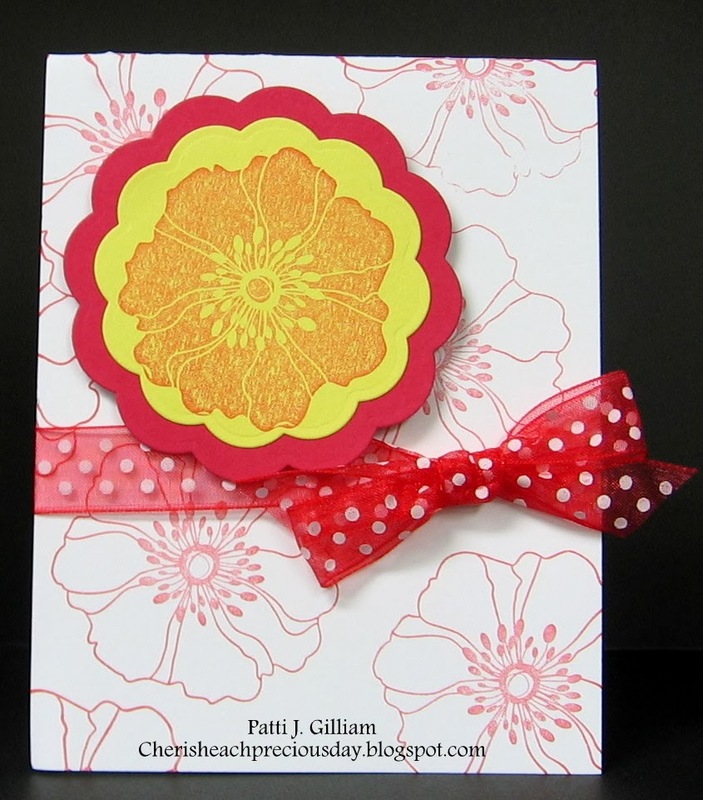 The second card uses both the Die-Versions DVW-322 "Crochet Lace" Die, and the Die-Versions DVW "Chrysanthemum" Whispers Die. The Chrysanthemum was cut from both white and Kraft. The Kraft was turned to show from behind the white piece. A sentiment and a bit of bling finished this card off nicely! I always use my Perfect Papercrating Tools to achieve the beautiful, even matting! See sidebar for details! I hope that you'll head over to the Die-Versions store, and do some shopping! and 'Like' our Facebook page! See you again on the 10th with my next project - I'll be showcasing some of the new release dies! We are completely iced in - going no place today, so you know what that means? Made this card for a couple we know that celebrated their fourth anniversary this week. Four whole months! My DH was the best man at their wedding, so this is a special occasion for them. Isn't it beautiful? Bridget was a real inspiration!!! That's all I have for today - have some special orders to work on, so off I go!